The ciliates are single-celled organisms with various numbers and arrangements of cilia. These cilia are tiny hair-like projections (comes from the Greek cilli, which means "eyelash") that are used as a means of locomotion or as a way to move food into an oral cavity and a mouth. In some organisms, cilia are fused together to form thicker and more rigid structures, called cirri (Greek for "tuft of hair"). Some organisms have cilia arranged in rows, where they act like wavy sheets. When cilia cover the entire organism, they tend to be arranged in diagonal rows. As a result, you can see these organisms spin as they move. 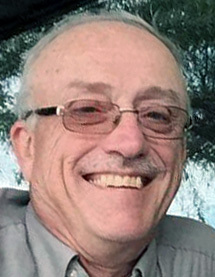 Those organisms with cirri (see Oxytricha and Oligotrichs) tend to have them located on the underneath or bottom portion, where they act like legs to move along surfaces. Ciliates may live as individual, free-moving organisms, as stalked and stationary organisms, or as colonial groups of organisms. Vorticella is both a stalked and colonial organism. 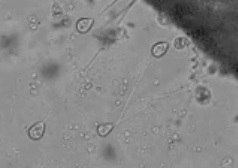 Some ciliates are visible with the naked eye, such as spirostomum and larger species of paramecium. 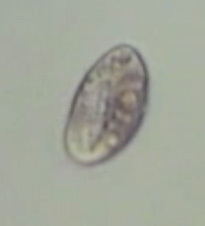 Most ciliates feed on bacteria and organic material, such as dead vegetation. However, some may be carnivores feeding on other protists. A few species are parasitic. Most ciliates reproduce by a process of simple fission or the splitting of cells. 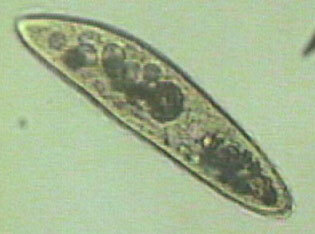 Others, such as paramecium, use a form of sexual reproduction, called conjugation. In such cases, two paramecium move along side one another and exchange genetic material. Paramecium caudatum - It is the second largest of the paramecium, ranging from 180-300 microns (or 0.18-0.3 millimeters) long. It has two contractile vacuoles. As with all paramecium, it has an oral groove where cilia move food into its mouth at the base of the groove. This groove extends a little more than half the body length with a narrower canal to the mouth extending another quarter of its length. Paramecium - bursaria group - It is the second smallest of the paramecium, ranging from 100-150 microns (or 0.1-0.15 millimeters) long. Spirostomum - It is one of the largest ciliates (plus or minus 600 microns or 0.6 millimeters). They are mostly found in freshwater, although the specimen shown here is from a saltwater aquarium. Its long cylindrical or tubular shape can be contracted very quickly. Oxytricha - This ciliate has groups of cirri clustered together on the bottom surface. Vorticella - Vorticella is a stalked, colonial ciliate (in some cases, they cluster together, but not as coordinated colony). They can appear attached to rocks, plants, or crustaceans (as found here), snails, and so forth. Their stalks contain a contractile organelle (similar to that in Sprirostomum) that allows them to contract rapidly. Condylostoma - Cilia in this organism are distributed across the entire body. 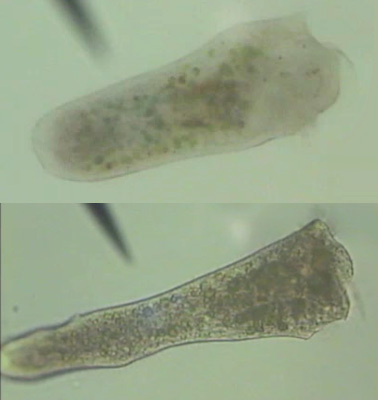 These ciliate can from 0.1 to 0.9 millimeters. As is apparent here, they can contract their bodies, while changing their shape. 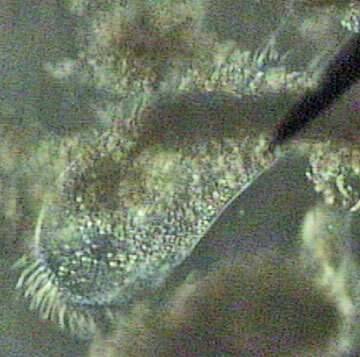 Coleps hirtus - These barrel-shaped ciliates are covered in plates in 12 circular rows and 24 rows along their lengths. It also has 8 spines on the back end and a mouth at the front end. Oligotrich - These ciliates tend to be http://jeffbloom.wikidot.com/foci:introtometapatterns or ovoid in shape. They have seven clusters of three cirri arranged around the middle or equator of the organism. These cirri are responsible for rapid bouncing or springing movements.